Tonight was the first dinner we cooked in our new apartment. I’m going to try to get into a habit of posting recipes, etc. so you guys have an idea of the food we’re eating here, since Italy is so…Italy…and really one of the grand highlights is the food. This can also serve as proof that we are not bums and, although American, we know how to cook and enjoy doing it. 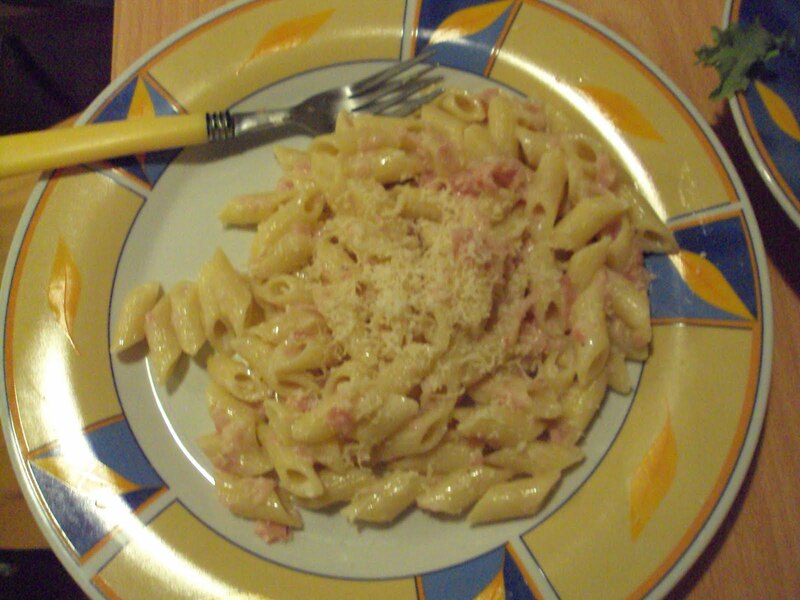 Boil pasta and when you’ve drained it, add the cream and ham, stirring until well-blended. Grate Parmesan cheese to taste if desired. We ate it with a side salad and for dessert, we had some cheese with honey (pecorino is good for this, but we had it with a softer cheese that is AWESOME for making grilled cheeses, called Torre Alta). We also had bread and olive oil & vinegar, as well as prosecco to toast to our new home. Buon appetito! *An improvement to the recipe that I haven’t tried yet but think could improve this recipe’s texture is just to pan fry the prosciutto after it has been cut only until it’s slightly crisp. **Note: A few days later, we had a similar dish with friends (See Cibooo e cena con amici) and he used tortellini with prosciutto and panna; the tasty addition: mushrooms. So, for a modified version, sauté a diced scallion with olive oil and add some diced mushrooms and the prosciutto to cook until the mushrooms are done. Add cream and sautéed ingredients to pasta, mix and serve.